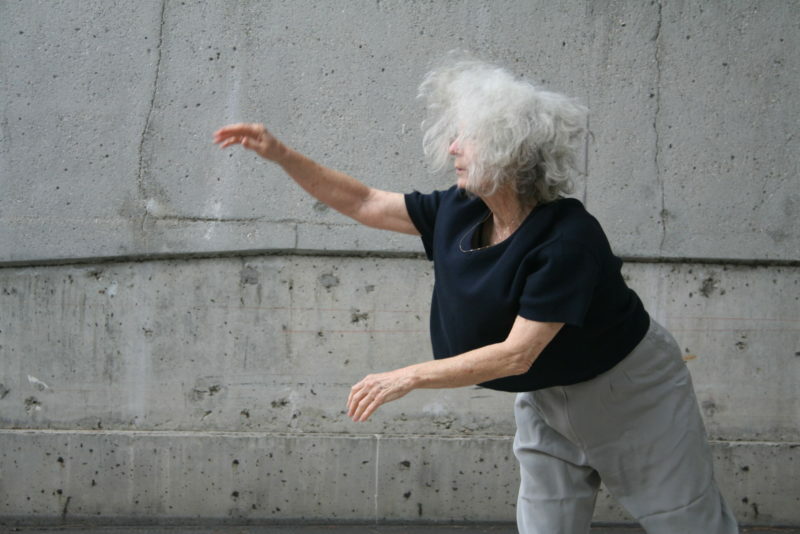 began dancing in 1955 with Anna Halprin, who was doing pioneering work in the teaching and performing of dance improvisation After four years of workshop study and performance apprenticeship at Halprin’s outdoor studio in the San Francisco Bay area, Simone moved to New York City. There she studied composition at the Merce Cunningham studio with musicologist /dance educator Robert Dunn, who was introducing dancers to the scores of John Cage. Thus she began her association with the Judson Dance Theater Group which revolutionized dance in New York in the 1960s. From her early minimalist dance/constructions through her animal studies, news animations and land portraits, Forti has worked with an eye towards creating idioms for exploring natural forms and behaviors. Over the past fifteen years Forti has been developing Logomotion, an improvisational dance/narrative form wherein movement and words spring spontaneously from a common source. Her book Handbook In Motion was published in 1974 by the Nova Scotia College of Art and Design and she writes regularly for the Contact Quarterly Dance Journal and the Movement Research Performance Journal. Over the years, Forti has received various grants including six NEA fellowships. In 1995 she received the Dance Theater Workshop "Bessie" New York Dance & Performance award for sustained achievement. Forti continues to perform and teach world wide, and is a visiting assistant professor in the World Arts and Cultures Department at UCLA.